Oyster Love | Travel Musings • Yummy Insights • Join me on my tasty journey! As Space Needle and salmon are the posterchildren for Seattle, the same is true for oysters … and I love ’em! Again and again I’m asked my opinion – not only on the best restaurants to get these sweet, briney treats-of-the-sea, but which varieties scintillate my tastebuds most. From my discussions of all-things-oyster with those in the know, I’m finding that love for a specific oyster type varies as much as flavors of ice cream. With four distinctive types in the NW (Olympia, Pacific, European Flat and Kumamoto), there’s truly something for everything in Washington’s oyster world! My understanding is that the tiny, yet plump, Olympia is the only native variety to the area – perhaps adding to my love-addiction. My first introduction to the oyster world came early on with the cracker-crusted, baked, out-of-a-jar type my mom was infamous for preparing. While not favorites as I reflect back, they certainly warmed my palate for the future. A trip in my early 20’s to Florida reminds me never to eat an oyster on the east coast. If you’re looking for a ‘gateway oyster’, Olympia is your bivalve of choice. Their sweet, palatable flavors (with a distinguishable cucumber aftertaste) is a perfect way to begin. Not too briney, and relatively mild, most anyone trying an Olympia will have a second (and a third). Let’s get down to the nitty (but not gritty) of this. Where do I recommend you satisfy your oyster cravings? Elliott’s Oysterhouse on Pier 55 has a reputation for excellence and absolutely stand behind it. Their shuckers are virtually an encyclopedia of knowledge when it comes to the little guys. The Brooklyn Steak, Seafood and Oysterhouse is another beautiful example of the plethora of options in the northwest (with accompanying vodka samplers to boot!). Blueacre, Harborside and Aqua by El Gaucho all have a stunning number of just-out-of-the-bay selections that’ll knock your socks off. But the crowning jewel for me? 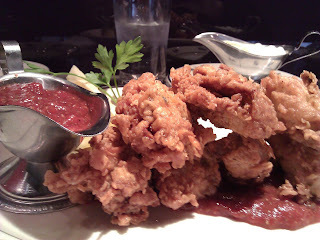 The flash-fried Totten Inlet Pacific oysters available at Steelhead Diner in the Pike Place Market. Can’t find me at lunch time? Look no further than the chef’s counter at Steelhead Diner watching on as chef Anthony prepares crispy, golden orbs of oystery-goodness nestled on a bed of bloody mary sauce. Wow! A surprising second-choice for the crisp-fried type? Just as the name suggests, Emmett Watson’s Oyster Bar, tucked in the bowels of the Pike Place Market marries ‘homey feel’ and ”delicious oysters’ perfectly. My advice? Don’t be afraid. Like ice cream flavors, they all beg for a taste. Try ’em and let me know — what’s your favorite?